The National Water Research Institute (NWRI) proudly announces its newest downloadable publication, Water 2010: A "Near Sighted" Program of Water Resource Management Improvements for the Western United States, prepared by Dr. William Blomquist of the Department of Political Science at Indiana University-Purdue University Indianapolis. System interties and mutual-aid agreements in every watershed and metropolitan area. Meeting realistic water conservation targets. Promoting uses of recycled water where it is already available. Storing more water underground at all feasible sites. Water banks in every state. Interstate water banks in every interstate river basin. Adopting and maintaining assured water supply requirements. Building the information infrastructure for more effective management. Building the organizational infrastructure for more active management. These 10 steps are intended to enhance - not impede - the success of longer-term projects and programs. To download this White Paper, please click here or see below. "A navigable waterway is any body of water than can float a court decision." In a nutshell, we said that science is being done in a fragmented fashion with no clear conceptual model. 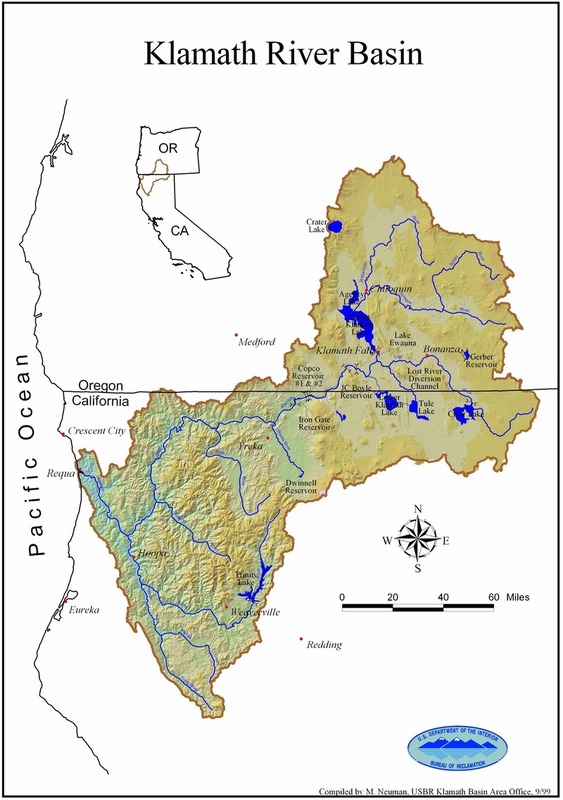 The tributaries must be considered (not done on the Instream Flow Study model). The news release and an Executive Summary can be downloaded below. 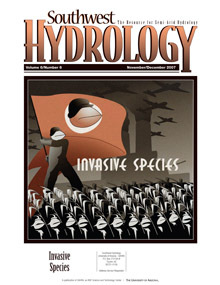 The November/December 2007 issue of Southwest Hydrology is devoted to those annoying flora and fauna we know as invasive species. Invasive aquatic plants: hydrilla, water hyacinth, water lettuce, and giant salvina grow rapidly, outcompete other species, impact water quality, and reduce native habitat. Arundo - the giant reed invades SoCal, obstructing flood flows, impacting water quality, and threatening native species. It consumes three times the water of native vegetation. What, nothing about "rock snot"? There is also an interesting article "The Dope on Dowsing", as Betsy gets a lesson on water witching. Plus you'll get all the SW water gossip you can handle. Hard to beat all that. You can access the issue by clicking here, then downloading it as a pdf if you wish (entire issue or individual articles). Back issues are also downloadable. And you can still get a free snail-mail subscription if you like. How many useful things can you get free nowadays? Water Conference Declarations: Alicante, Brisbane, Irvine, and...Portland? It's getting so that you cannot have a conference these days without issuing a "declaration", listing the key findings, a call for action, etc. Everyone seems to be doing it. Sometimes these things can get a little touchy. I went to a water conference in a Middle Eastern country a number of years ago. The declaration got hung up because some wanted an item in it about encouraging and empowering women vis-a-vis water management decisions. The declaration at the Third World Water Forum in Kyoto, Japan, was watered down (pardon the pun) by the government representatives. Now we have the Brisbane Declaration, which claims that Environmental Flows are Essential for Freshwater Ecosystem Health and Human Well-Being. The declaration presents summary findings and a global action agenda that address the urgent need to protect rivers globally as proclaimed at the 10th International Riversymposium and Environmental Flows Conference held in Brisbane, Australia, on 3-6 September 2007. Key findings ranged from stating that water flowing to the sea is not wasted to flow alteration imperils freshwater and estuarine ecosystems. One of their action items is impractical: Estimate environmental flow needs everywhere immediately. That's nice, but not very realistic; sounds more like a goal than an action item. It's the hydrologic equivalent of Eliminate all poverty now. Nice, but no way it's going to happen. In December 2008 we have been forewarned that we will have the Irvine Declaration, named after the metroplis of Irvine, CA, or perhaps the University of California-Irvine, where the International Conference on Water Scarcity, Global Changes, and Groundwater Management Response will be held 1-6 December 2008. I'm co-chairing an international conference of my own in October 2008, the International Conference on Non-Renewable Ground Water Resources in Portland, OR. Is my conference going to have its own declaration? What do you think? Jim Thebaut, president of the non-profit The Chronicles Group and the man who made the landmark film Running Dry about the world humanitarian water crisis, is back behind the camera. Until about two weeks ago I had not encountered Jim for about two years, after having seen his film and met him at the Third World Water Forum (3WWF) in Kyoto, Japan, in March 2003. The film so impressed me that I invited him to the University of New Mexico, my former institution, to show the film and meet with the university and local communities. Both he and the film were huge successes. So I was pleasantly surprised when I saw Jim sitting in the breakfast room st the Embassy Suites Hotel in Albuquerque, NM, during the AWRA meeting. He told me he was in New Mexico waiting for the film crew for his new water documentary, The American Southwest: Are We Running Dry? Below is a copy of the press release. Grants to support the flim have been made by the Metropolitan Water District of Southern California (MWD), Southern Nevada Water Authority (SNWA), American States Water Company (ASWC), as well as other organizations. Vegas PBS will present the film, which will debut in Fall 2008 on Western PBS stations followed by live in-studio simulcast town hall meetings. Jim's skills as a filmmaker will be welcomed to depict a complicated problem, one that affects us all, not just the USA Southwest. My hope is that, given the sponsors, this will not be more of the "SOS" but a critical look at what needs to be done and what might happen if no substantive changes are effected. Jim assured me that this will be the case - it will be a solutions-based approach. what will happen if the Southwest is in fact in the midst of a "megadrought" period (c. 40-50 years), i.e., a view of the apocalypse and how we will cope with it. See my 21 July 2007 post, "The Struggle to Secure Water in the Southwest USA". But if anyone can present the real story, it's Jim Thebaut. 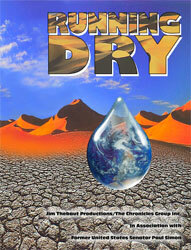 I'll anxiously await The American Southwest: Are We Running Dry?